Our agents are our strategic partners, to this end as part of our every 6 months joint session we have held the latest edition of Agents Conference from March 16-18, 2018 in Addis Ababa. The event is designed to meet our joint business partnership and to enhance our strategic partnership. 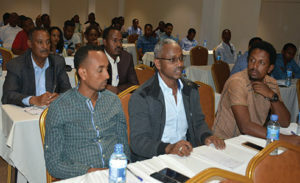 On average the conference draws around 60 participants that were came from various regions. With the information transfer to the agents and the feedback received, a solid foundation has been laid from where to successfully continue and grow the joint business partnership.